Michigan Dental Association is Michigan’s source for oral health care, catering to both patients and dentists alike. With over 5,500 members, MDA helps visitors find dentists, answers questions about oral care and dental insurance, supplies teaching materials, and more. 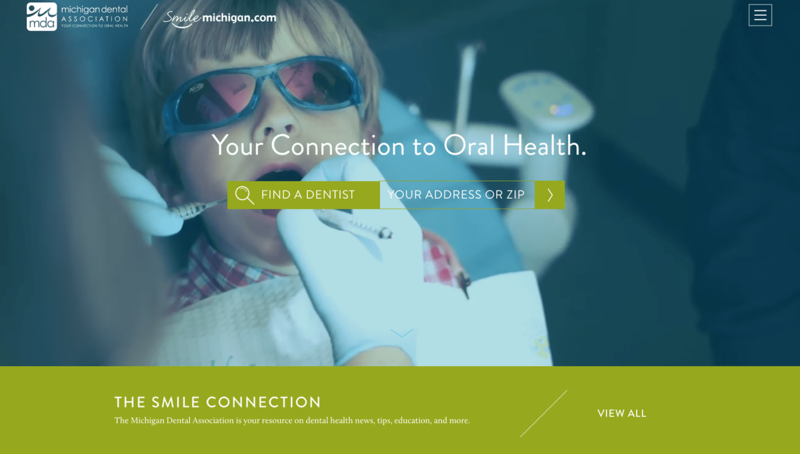 Michigan Dental Association has five associated websites, their main site, a foundation website, insurance website, an online store, and an intranet site called “The Buzz”. In the years prior to working with Web Ascender, Michigan Dental Association had worked with a number of website and IT service providers. They came to us in 2007 looking for a new and reliable website service provider. In the following years, they wanted more websites to be built for their specific offerings, foundation, internal communications, and online store to better engage and serve their audience, and, in 2013, they came to us for a website redesign to keep their online presence fresh. 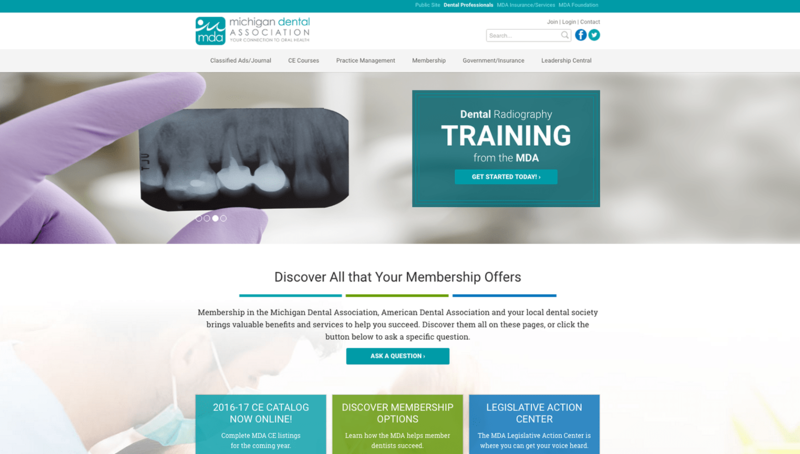 Over the years, we’ve created countless solutions for Michigan Dental Association, building their home site as well as websites for MDA Foundation, MDA Insurance, MDA Online Store, and their Intranet site (The Buzz). All of these web solutions were designed to reflect a cohesive branding while still representing distinct sites. We also implemented responsive design across all of their websites to accommodate visitors from desktop, laptop, tablet, and mobile phone. These websites were built using DotNetNuke, and MDA staff have become experts at using the content management system, using it to its full potential. We’ve also helped them with event registration, e-commerce, membership applications, legislative efforts, and more. Michigan Dental Association wanted an intranet site to share information within the company, and so “The Buzz” was created. The idea was to create a homepage that would provide members with immediate access to the all of the content on the intranet server, with more visibility of most-frequently viewed content. With the end goal being an easy-to-navigate, visually appealing, and fun intranet site, a blog feature was created, along with frequently used forms, a graphics and logo library, announcements section, and a prominent image rotator. Other re-organized content on the site included a staff directory, event calendar and technology training materials. A unique feature of the design process was creating a staff directory built to look like profile pages. The profile pages include a staff photo, title, and biography. MDA Foundation focuses on improving dental health communities throughout Michigan as well as providing scholarships for students in dental programs. 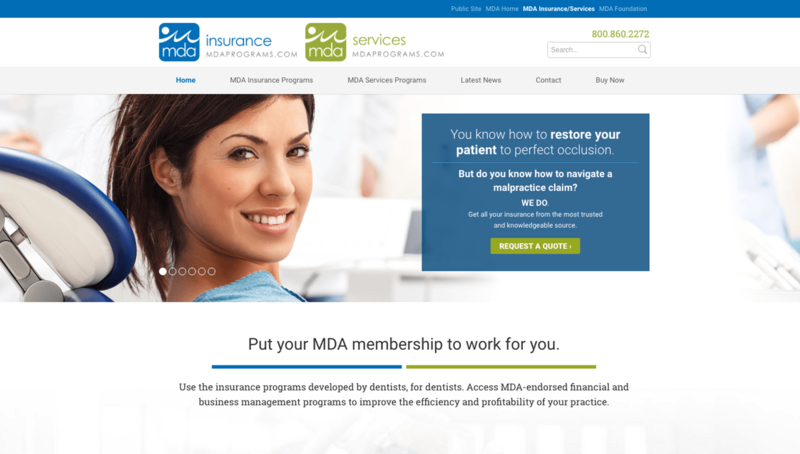 MDA Foundation was looking for a website redesign to keep brand consistency between the other MDA sites. Even though the new DNN website is part of a group of websites, it is different enough to set it apart as it’s own product. The website features a custom donation form that allows donors to choose which cause they want to donate to, and gives them an option to finance their donation monthly. The custom donation form was a challenge for our team, but they were able to complete it staying within the budget using FormMaster and Paypal. Michigan Dental Association and Web Ascender had been working closely for many years, so when they wanted to build out a website specifically for their insurance offerings we were the obvious choice. Together we created a valuable resource for both prospective customers and existing members. A website that gives prospects plenty of opportunities to ask a question or get more information and for customers to do common tasks like update their contact information. Our good friends at Michigan Dental Association were in a bind before we started this project. They had been using the same e-commerce system for over 5 years and with little notice the 3rd party e-commerce service shut down. MDA needed a solution quick, so they contacted the team that they knew would come through for them. Web Ascender quickly moved into action and had their new e-commerce system up and running with all the products migrated in a couple weeks. What is Michigan Dental Association Saying? Want to see if we can do the same for your business?